Donegal produced an impressive second-half display to defeat Down in the Division One clash at Ballybofey. Poor finishing from the All-Ireland champions allowed Down to move into a three-point lead. Donegal scored the last two points of half to trail 0-5 to 0-4 at the break and they surged clear on the restart with seven points without reply. Down went 31 minutes without scoring before late consolation points from Donal O'Hare and Kevin McKernan. 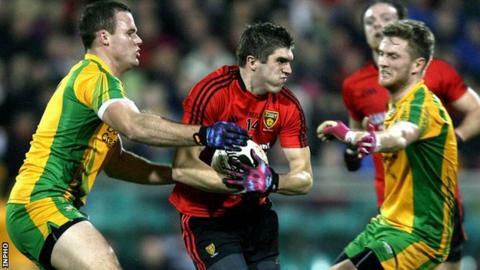 Ryan McHugh, son of Martin and brother of team-mate Mark, was making his senior debut for Donegal. Donegal captain Michael Murphy sent over the first point of the game but the wides soon stacked up for the hosts and Down capitalised. Donal O'Hare slotted over four points, three from frees, while McKernan converted a long-range free. The first half finished with frees from Colm McFadden and Murphy as Donegal began to find their range. Donegal were at their clinical best early in the second half with Murphy (3), Rory Kavanagh, Leo McLoone, Ross Wherrity and Declan Walsh on target. O'Hare finally registered Down's sixth point and it was quickly followed by another from McKernan. Daniel McLaughlin's point ensured Donegal had the final say as they bounced back from an opening defeat by Kildare. "We were under pressure after the Kildare result so we really needed the win," said Donegal defender Eamon McGee. "We didn't give a good showing in the first half but we were very good in the second half and we're delighted to get the points."